Good running conditions resulted in 52 runners and walkers turning out for the 2019 UMPI Spring Runoff 5K Road Race on Saturday. 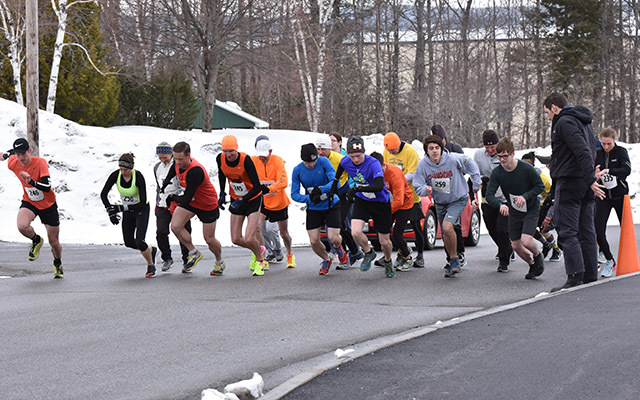 PRESQUE ISLE, Maine — Good running conditions resulted in 52 runners and walkers turning out for the 2019 UMPI Spring Runoff 5K Road Race on Saturday. The winners of the 5K were the 1993 certified course record holding husband and wife duo of Curtis and Gabby Wheeler of New Sweden, who clocked times of 17 minutes, 44 seconds and 18:39, respectively on Saturday. Course record holders prior to certification in 1993 are Paul Plissey, formerly of Presque Isle, and Emily Higgins-McDevitt of Camden. Plissey ran 14:57 and Higgins-McDevitt 18:39 in the 1982 race. Gabby Wheeler’s time on Saturday ties Higgins-McDevitt’s mark. The results from this second race of the county Challenge Series will be compiled with those of the Katahdin Trust Snow Run held in February in Houlton to determine who the early season overall and age leaders are. Saturday’s age group winners were: walkers: Herbert Arce (Woodland, 49:47) and Alisha Arce (Woodland, 55:38); 14-and-under: George Ferland, Jr. (Stockholm, 22:55) and Teanne Ewings (Houlton, 19:50); 15-19: Dylan Marrero (Woodland, 18:38) and Teagan Ewings (Houlton, 23:34); 19-29: Hunter Dionne (Raymond, 22:54) and Mandy Graham (Connor TWP, 21:14); 30-39: Thomas Wire (New Limerick, 17:53) and Marie Beckum (Caribou, 22:49); 40-49: Thomas Beckum (Caribou, 18:58) and Lori Scovil (Presque Isle, 23:23); 50-59: Craig Reese (Presque Isle, 22:59) and Kim Wright (Mapleton, 23:17); 60-69: Bruce Clark (Houlton, 21:23); and 70 and over: Ed Malone (Stockholm, 27:06). The next race in the County Challenge Series is the S.W. Collins 5K on June 23. The day features kids’ fun races beginning at 9 a.m. followed by 5K walkers at 9:45 a.m. and 5K runners at 10 a.m. For more information contact Leslie Jackson at 207-496-6723 or at lesliej@swcollins.com.